When you define the purpose of an intranet, there are several angles to examine. Each angle requires making a choice. However, they are not mutually exclusive choices. They are choices about what you decide to emphasize. 1. 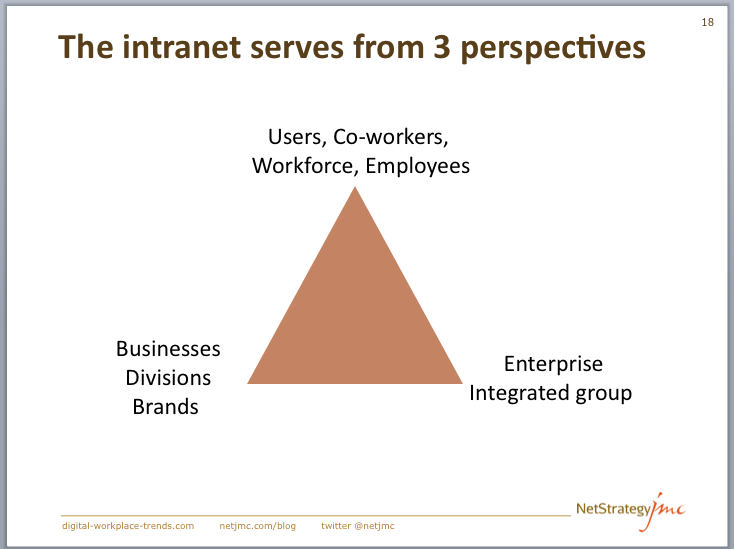 Look at the intranet and its services from three perspectives: the co-worker, the business and the enterprise. Are you serving all three well? For example, is there anything going on in the economic environment that means you should give extra support to business managers? Is your enterprise undergoing a down-sizing or transformation program that requires special support to employees? Needs change over time. Needs can also be very temporary but nonetheless critical for the company. Simply put, take your head out of the intranet, and think about your company, your business and the people. What do they need? 2. What do you need to emphasize? People need to communicate, collaborate and work. These should all be part of the purpose of the intranet. Are we trying especially to improve communication? If so, are we talking about bottom-up, horizontal or top-down. Which flow is the weakest in our organization and how can we improve it? 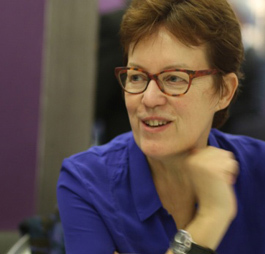 Does our business need better collaboration, across different silos for example? Are we working on projects that need more efficient ways of supporting virtual teams, or teams that include our employees and external partners? How can the intranet help? Do we have business processes that should be supported by the intranet? Through a portal? Through integration of core process applications? Do we have secondary processes that we could integrate into the intranet? This could save time for employees and process owners. Simply put, where do we want to put the emphasis? 3. Do you want to position your intranet as a layer or as an integrator? Do you envisage a flat, thin layer over a lot of specialized sites, each one independently serving its users? Do you envisage a customized, single entry point into all the company’s information, applications and resources. I say “attempting” because doing this successfully is hard and rare. Understand what is common to all, and ensure that it is found only on the intranet-portal, leaving the specialized content for the independent sites. Otherwise, these sites will become the entry points for their users who will thereby not see the common, shared information and messages. Or they will see out-of-date common content because the site manager will not have realized there has been an update. Specify the purpose and scope for each piece: the layer and the underlying sites. They will most likely – all taken together – cover all the points in Angles 1 and 2. The biggest challenge here is accepting that in most large enterprises, from 10 to 15% of the content and services are common and the rest is specific. This is a switch from the way most headquarters-based intranet teams see things. Readers: please join the conversation. How have you gone about defining the purpose of your intranet or portal? Previous PostSocial media on a global intranet – how do you choose?